In general, I prefer fresh vegetables over frozen but you definitely can’t beat the covenience of frozen vegetables. 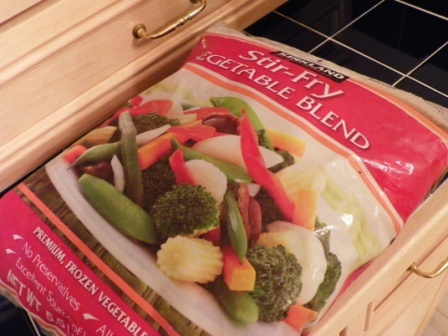 On my recent trip to Costco, I found this wonderful blend of frozen veges, which is just perfect for times when I want a quick side dish with a minimal amount of fuss. :-) For this homestyle dish, I used a combination of light soy sauce and oyster sauce for seasoning. I tend to avoid using oyster sauce by itself, finding it too sweet for my liking but when combined with soy sauce, it makes a delicious savory flavoring. Heat the oil in a large nonstick skillet over medium-high heat until shimmering. Add the garlic and cook until fragrant and lightly browned, about 30 seconds. 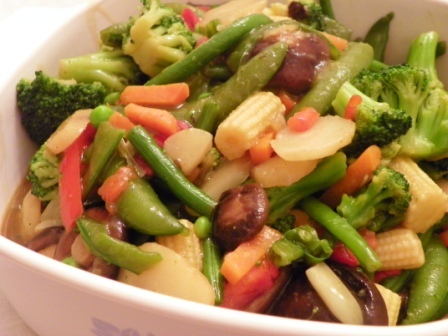 Add the frozen veges (no need to thaw first), and the sauces, and cook, stirring frequently, until tender. In a small bowl, dissolve the cornstarch in the 3 tablespoons of water, then add to the skillet; cook, stirring constantly until the sauce is thickened and evenly distributed, about 30 seconds. Serve hot.